style rookie: and then she fell out of the sky and yelled "proofread like a bird!" and then she fell out of the sky and yelled "proofread like a bird!" Hello readers. I am writing Monday night and plan on scheduling this to publish tomorrow at approximately 3:24 PM Central time. This "scheduling" biz is a new technique, often used by spies such as myself, and you must keep your knowledge of its existence top secret. I am writing because tomorrow will be hectic and busy, but that's nothing new. Spies like myself have millions of important tasks we must complete every day. A top secret meeting with Rich of Weardrobe will take place, and I received something quite marvelous in the mail today which I will share later this week. Why not now, you ask? Oh dear readers. Part of being a spy is maintaining a mysterious air about yourself. I suppose I could tell you right now, but that would be too easy. And spies prefer to do things the hard way. The challenging way. I rather enjoy this type of writing, and what I enjoy even more is the fact that being a spy has nothing to do with my outfit or these pictures. top, used to be mom's. 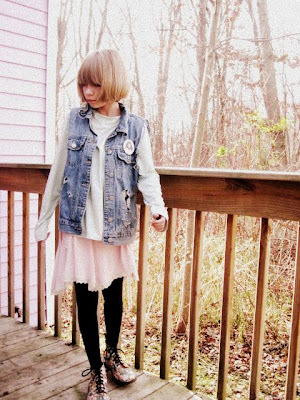 studded denim vest, childhood closet/DIY. hand-me-down skirt. H&M tights. floral dr. martens via ebay. pin is of my dad when he was young and "hip" and I have no clue why or how I have it.